The N61Jv has a split personality as far as appearance goes. The cover once again uses a dark enamel finish that shows every little smudge or fingerprint—and the same of course applies to the glossy LCD. The LCD bezel is also glossy black, but the palm rest and keyboard have a nice matte finish. The N61Jv-X2 comes with a "dark brown" cover, which you probably won't notice at first glance. I thought the unit was black, so when ASUS sent a link to the Amazon page I asked if all of the units used the "new brown cover" in place of the "black cover" on my test system. Only later did I realize that I did in fact have a "brown" notebook. If you catch it at the right angle in the right light, you can see the brown pattern, but honestly I don't know what sort of lighting Amazon used for their photos because try as I might, I couldn't get the pattern to show up well. Perhaps in a bright white, halogen-lit office complex it would be more apparent, but carrying it around my home and outside it looks mostly like an enamel black cover. With fingerprints. Open up the notebook and the appearance changes completely. In place of the glossy plastic on the outside and unlike the UL series, the inside of the N61Jv is composed mostly of matte finishes. The palm rest has a sort of "rubbery" textured plastic found on some mice and keyboards, along with the Alienware M17x and ASUS G73J. The technical description is a "soft touch rubberized painted plastic" surface for the palm rest; whatever it's called, we like it, and we wish the top cover used the same material. 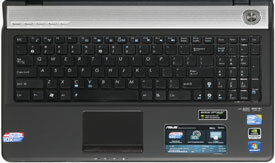 The keyboard is of the chiclet variety and has a good feel and key action. We only have one minor complaint with the keyboard, and that's the use of a half-size "0" key for the number keypad. 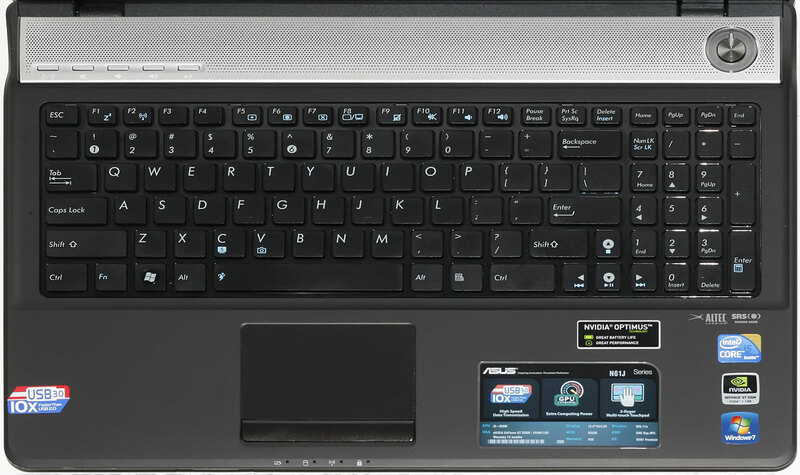 Above are two different keyboards, on the left is the ASUS N61J and on the right is the Acer Aspire 5740G; Acer gets the number keypad right. 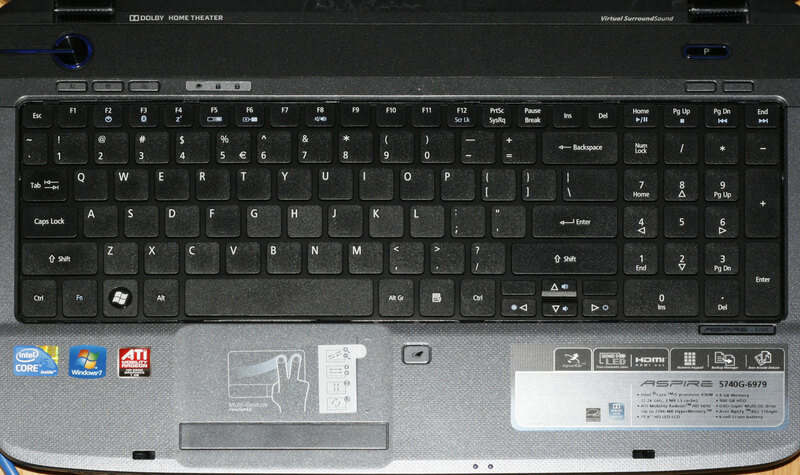 If a company is going to go to the trouble of fitting a 10-key into a notebook, they need to use the standard layout. Yes it's a minor quibble, but it's our only real complaint with the keyboard. We do feel there are better keyboards out there, but that's largely a matter of personal taste—I'm partial to the Lenovo ThinkPad T410 approach, with raised and contoured keys that feel more like a desktop keyboard. If on the other hand you prefer chiclet keyboards, the N61J won't disappoint. The build quality and construction of the N61J are very good, with no noticeable flex in the keyboard or chassis. If you press quite hard, you can get the keyboard to flex very slightly, but it requires an unreasonable amount of force. The LCD panel has a solid backing that doesn't show any distortion on the screen of you press against the back of it. Our one concern is the panel hinges; they feel fine right now, but we're using a brand new notebook. Long-term they may wear out, but then extra stiff hinges have been known to crack the plastic chassis over time so it's a tough call. Accessing the internals to make any upgrades is quite simple, with a small cover providing access to the hard drive and a larger panel for the RAM, CPU, and mini-PCIe (occupied by the WiFi card) slot. Even with the ease of access, outside of upgrading to 2x4GB RAM or a new HDD/SSD, there's not much need to get at the internals. The only blemish on an otherwise excellent design is the LCD panel. It has limited horizontal viewing angles and the contrast is quite poor—both are qualities of inexpensive laptop TN panels. Backlight bleed is easily visible, with "blacks" that look more like dark grey. The problem is finding something that's clearly better without spending more money. RGB LED displays can look great, but they cost significantly more than regular LED panels (over twice as much). We've seen a couple ASUS laptops with better contrast ratios, but most laptops source LCDs from several manufacturers so even getting the same model laptop is no guarantee. While we could wish for a better display, at least we can say that the N61Jv isn't clearly worse than the competition in this particular area. One other oddity that we mention more as a potential help than as a warning is that we did experience a BSOD at one point during testing. Now, the cause of the BSOD can't be put on ASUS: we connected an old X-Rite DTP-94 colorimeter. We have tried using this colorimeter on quite a few laptops and desktops, and to date we have not found a single Windows 7 system that won't BSOD when we connect this older peripheral. We've had to move on to an i1 Display 2 colorimeter for our LCD testing because of this problem, but the BSOD did cause some other behavior that we've passed on to ASUS. Specifically, after the BSOD we booted into Windows only to find that our GT325M was gone. After rebooting and trying to reinstall drivers, we were at a loss as to what had happened. Eventually, we were able to determine that the fix is to do a complete shutdown (not hibernate or restart) and then power up the system, and the GPU would be back. We don't know if this is specifically related to the BSOD caused by the DTP-94, and we didn't have any other instabilities or blue screens during testing, but if you should happen to experience a similar situation and "lose" your GPU, hopefully this will help. Finally, just to reiterate what we've said in the past: Optimus laptops are intended to run Windows 7. We successfully booted off a Ubuntu 9.04 Live CD with the ASUS UL50Vf, but the GPU was obviously not enabled and it ran off the Intel GMA 4500MHD IGP. The N61Jv didn't fare so well, as Ubuntu 9.04 booted into a "VGA Compatible" mode and 9.10 ended up at a black screen rather than the login prompt. Most likely, this is a problem with the new Intel HD Graphics IGP in the i5 CPU and we would need to use a different flavor of Linux. Regardless, if you want to use a discrete GPU with Linux, you won't want Optimus. Since the Optimus GPU has no direct link to the video output and the Optimus driver copies data from the GPU framebuffer to the IGP buffer at a low level, you would need a similar approach to get an Optimus GPU working under Linux. It's possible someone outside of NVIDIA can enable such a feature, but we're not holding our breath and NVIDIA isn't committing any resources to such a project right now. Taken as an entire $900 package, we really can't fault ASUS' choice of components. The only missing feature is FireWire support, but including USB 3.0 easily trumps that in our book. Higher specced versions of the N61J also exist, including the N61Jq-X1 with i7-720QM and HD 5730 graphics; we expect to see lower spec models as well with i3-330M CPUs, but we don't have any details on those yet. We would have liked a slightly higher battery capacity, as 48Wh is on the low end of the spectrum for a midrange laptop, but battery life is still reasonable. If you're looking for a very well balanced platform that can handle multimedia, gaming, and office tasks, it will be hard to beat the N61Jv-X2.